Sen. Elizabeth Warren (D., Mass.) has a new essay in Foreign Affairs outlining her platform for a new American foreign policy. Titled "A Foreign Policy for All: Strengthening Democracy—at Home and Abroad," the piece is trite, at times contradictory, and includes policy proposals that would endanger American national security. One cannot dismiss Warren's ideas, however, as they represent the thinking of much of the Democratic Party; moreover, Warren is expected to run for president in 2020, and will likely be an early frontrunner. So let us briefly examine Warren's essay, and her vision of American foreign policy inspired by democratic socialism and naïve pacifism. For Warren, a basic problem of American foreign policy is that, in recent decades, "Washington's focus has shifted from policies that benefit everyone to policies that benefit a handful of elites." International economic policies and trade deals, she writes, have boosted corporations and the privileged few at the expense of the working middle class. The reason: the U.S. exported a "brand of capitalism" that promoted less regulation and lower taxes on the wealthy, which also created the conditions for competitors like Russia and China to rise on the international scene. Putting aside the fact that billions of people around the world have been lifted out of poverty by capitalism (which Warren acknowledges only in passing), open, capitalist markets have clearly helped created more pro-Western societies. Just look at east Asia and eastern Europe. How could anyone say that the Baltic states, for example, are not much better off now than when the Soviet Union collapsed? Furthermore, it is painfully simplistic to say that an "exploitative" economic model was the sole cause of these developments; there are too many other factors at play, including internal dynamics in the affected countries. Regarding Russia and China, would Warren have favored a more hard-line approach, rather than an outstretched hand to welcome them into the global economy? That is what she implies, but such a view contradicts her preference for cooperation over confrontation. 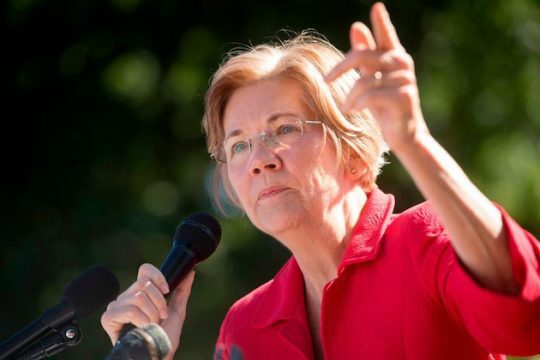 Warren's economic solution is to "level the playing field" for U.S. businesses and to use trade negotiations to "curtail the power of multinational monopolies and crack down on tax havens." Curiously, she does not say that trade deals should enrich the United States and its allies and advance geopolitical goals. Beyond getting out of the Middle East, Warren wants the United States to get out of the business of hard power. "Having a strong military doesn't mean we need to constantly use it," she writes. "An effective deterrent also means showing the good judgment to exercise appropriate restraint." Warren goes on to decry the defense budget and calls for a reallocation of resources away from the Pentagon and toward diplomacy, development, and other tools of American power. Here is the problem: a recent report from the bipartisan National Defense Strategy Commission notes that "America's military superiority—the hard-power backbone of its global influence and national security—has eroded to a dangerous degree." Now is the wrong time to cut defense spending, especially when, as Warren writes, Russia and China are gaining on the United States in so many military areas. Warren links her criticisms of America's economic and security policies, arguing they show a flawed belief in Washington that American leaders could build democracy everywhere—either through capitalism or military force. She is right that this belief is flawed; the U.S. is unable to foster democracy that easily. The irony here is that, in many cases, a strong American military presence has been the key, but not sole, ingredient to promoting democracy in countries around the world—a point that is anathema to Warren's progressive worldview. Moreover, on the one hand, Warren seems to argue against America using its power to promote democracy, but on the other hand, she repeatedly warns of the danger of democracy receding around the globe. So would a President Warren try to use American power to promote democracy or not? The answer is unclear. A large section of Warren's essay calls for nation building at home. "With American power increasingly challenged from within and without, we can no longer afford to think of our domestic agenda as separate from our foreign policy," she writes. "A stronger economy, a healthier democracy, and a united people—these are the engines that power the nation and will project American strength and values throughout the world." We have seen this idea put into practice, during the Obama administration. The talking point that America is too engaged abroad and must turn inward has been so overused in recent years to the point of making it irrelevant. Of course America's internal situation is important for its external activities. That is obvious. The people who make that point publicly, however, such as Warren and Obama, too often adopt an approach to foreign policy that resembles isolationism more than anything else. There is an antagonist in Warren's essay, naturally: President Donald Trump. Warren repeatedly blasts Trump as a warmonger who has reneged on his campaign promises to look out for the working class and bring American soldiers home. She argues Trump is perpetuating all the problems that she identifies. The great irony of Warren's essay, however, is that she echoes virtually all of Trump's talking points identifying the problems with American policy: elites exploiting the working man, endless wars abroad, etc. The thing is, both are right to some extent. The difference is what to do from there. And in an increasingly dangerous world, prioritizing American power over vague notions of equality and justice sounds like a better bet. Whether Warren likes it or not, the United States has largely been, and should continue to be, the world's policeman. Why do we have freedom of navigation in the world's waterways, for example? Because of the U.S. Navy ensuring that freedom. Seeing American action as the main cause of the world's chaos, rather than the actions of those who would do us harm, abuse human rights, and violate international law, is both counterproductive and immoral. The United States is still the world's only superpower, and this privilege carries with it difficult responsibilities. Many Americans want out of the global leadership business. But, in the words of Elizabeth Warren, we persist—because there is no other good option. This entry was posted in National Security and tagged Elizabeth Warren, Military. Bookmark the permalink.